Happy first day of spring everyone! I don't know about where you are, but the weather here is cool, rainy and rather dreary. Very springy don't you think? When the weather is like this, what is better than coming home on a cool and rainy day to a big crock pot full of warm and yummy honey sesame chicken? Not much. Okay, maybe a big cookie and a cup of cocoa, but that's probably not the best thing to do. Although it sure does sound delicious, it's not so nutritious. As you already know, the crock pot is one of my all time favorite kitchen appliances. Well, next to my Kitchen Aid stand mixer that is. There is no doubt that my mixer is my favorite and my true BFF in the kitchen. I am sure you knew this already though. Nevertheless, the crock pot is still one of my favorite and it has endless uses - from making desserts, to sauces, to homemade stock and so much more. Did you know you can even bake in it? I had no idea about this until recently. Crazy! Now, I have made sesame honey chicken in the crock pot before, but this recipe was different and it was skinny. Even better! I have ten more pesky pounds to lose before my sisters big wedding day and I will take all the help I can get in the lower calorie but still totally tasty and delicious category. And I am sure you are looking for the same thing. Maybe not to lose weight, but to get a wholesome and yummy dinner that is both tasty and healthy for you and your family! I think this dish will do just the trick to even please the pickiest of eaters in your family. When I saw this new recipe for sesame honey chicken, I knew I had to try it. To be honest, it sounded too good not to try! In fact, my mom was the one who suggested we tried it. I actually had the Friday off we decided to make this, so I threw it all together in the afternoon and had it ready to go by the time she got home. It couldn't have been easier - throw in the chicken breasts and then pour over the flavor town mixture of honey, garlic, sriracha, soy sauce and more! Let everything cook together for about 4 hours and then pull out the chicken and shred it up. At this point, it should be just falling apart and oh so tender. Just the way you want it to be! While the chicken is cooling a bit, you will thicken up the sauce and juices by adding a bit of cornstarch and let sit for about 20 minutes. Once the sauce has thickened up, add the chicken back to the crock pot and you are ready to go. The best way to have this totally delicious chicken is over a bed of brown rice and then top with sesame seeds and green onions. For exra veggie power, serve with a side of stir fried broccoli or snap peas! This honey sesame chicken is totally healthy, totally yummy and the best part of all, it will keep you full and satisfied. At 185 calories for a big 2/3 cup, this dish is a winner. With a half cup of brown rice, you are looking at under 300 calories for the total meal. A fab meal for under 300 calories a serving, now that's what I'm talking about! Plus, the leftovers are great for the next few days or you can even freeze individual servings for a grab and go lunch. How more perfect can this crock pot recipe get? Not much. Just saying. served and ready to eat. yum! Place the chicken in the slow cooker and season with black pepper. 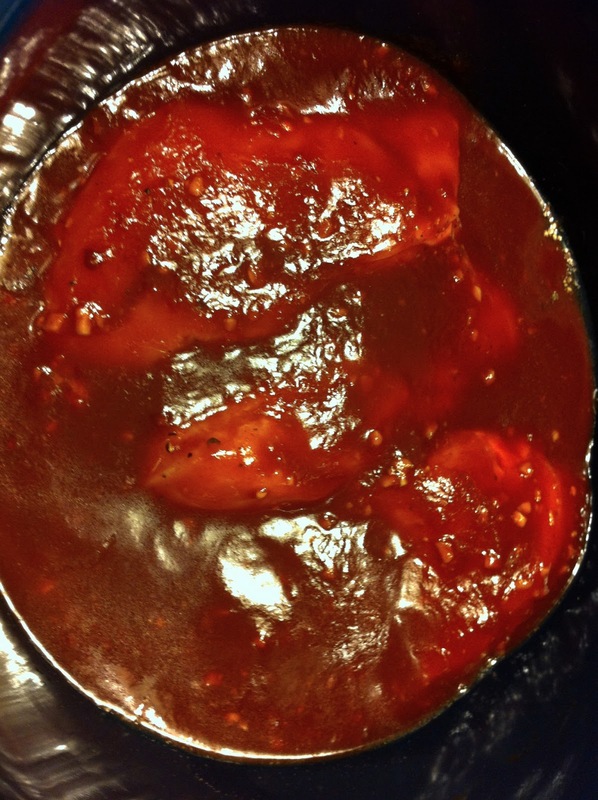 In a medium bowl, combine soy sauce, honey, tomato paste, vinegar, garlic, 1 tbsp water, sesame oil, onion powder and sriracha hot chili sauce. Pour over chicken and cook on low for about 4 hours. Once the chicken is cooked remove it, leaving the sauce in the slow cooker. Shred chicken with two forks and set aside. 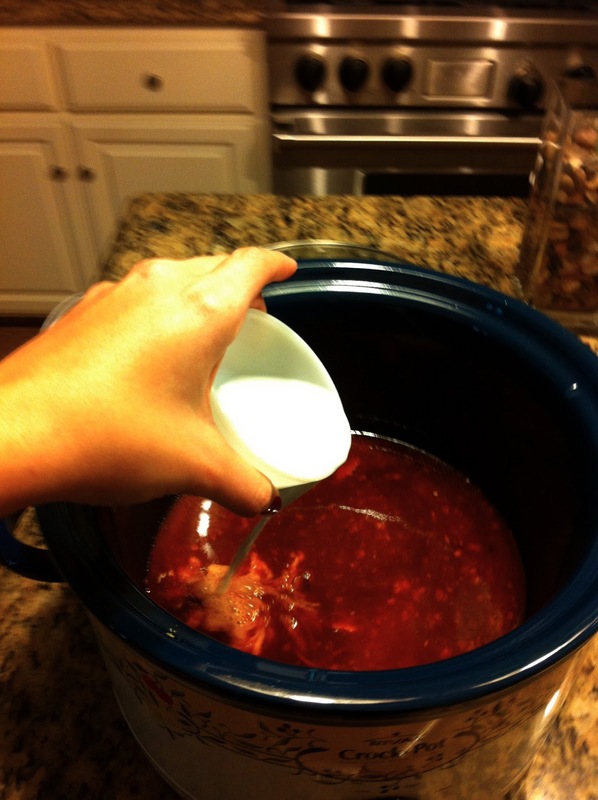 In a small bowl, dissolve cornstarch in remaining 1/4 cup water; add to the slow cooker and stir to combine. Cover and cook on high until slightly thickened, about 15 to 20 minutes; return chicken to the slow cooker and mix well. Serve chicken and sauce over rice and top with sesame seeds and chopped scallions for garnish. Enjoy! This honey sesame chicken may never make you go back to your favorite chinese take out for a quick dinner again!